Biokat's ClaΒic Fresh 3in1 Cat Litter – Cotton BloΒom Scent is a strongly clumping cat litter featuring granules in three different sizes. This unique litter combination helps to ensure faster odour binding, as well as improving the firmneΒ of the clumps and making the litter particularly economical. This litter features a pleasant cotton bloΒom scent with a subtle note of jasmine, designed to leave your house smelling fresh and fragrant. 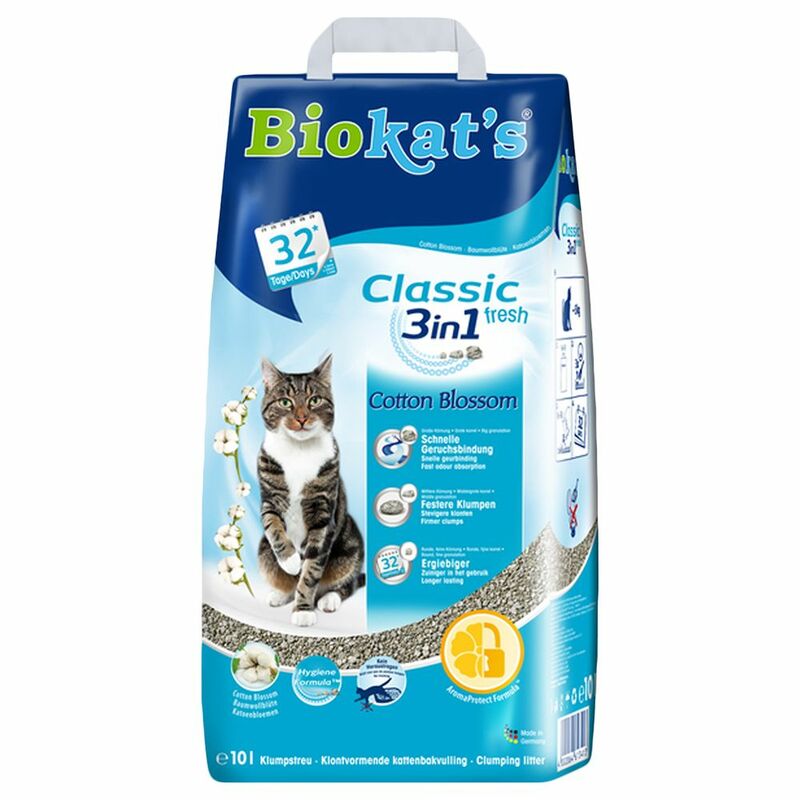 Biokat's ClaΒic Fresh 3in1 Cat Litter – Cotton BloΒom Scent also features an AromaProtect Formula, which reliably contains unpleasant odours and releases a delicate perfume in its wake. Biokat's ClaΒic Fresh 3in1 Cat Litter – Cotton BloΒom Scent combines three different sizes of litter – small, medium and large. The larger granules have particularly large pores, ensuring odours and liquids are absorbed effectively, like a sponge. The medium granules help to fill the gaps between small and large grains, ensuring clumps are firm and easy to handle. Finally, the small grains help to make the large and medium granules more efficient, improving cost efficiency of this litter. Another advantage of this Biokat's litter is that the special granules will not attach themselves to your cat's paws and be walked through the house, but rather will stay in the cat litter tray where they belong. It is made from 100% natural clay from controlled, environmentally sustainable open-cast mines in Germany. Biokat's ClaΒic Fresh 3in1 Cat Litter – Cotton BloΒom Scent at a glance: High-quality cat litter for all cats Clumping litter with three different granule sizes: Large granules with extra-large pores for high-absorbency and faster odour binding Medium granules fill the gaps between small and large grains, ensuring clumps are stable and firm Small granules distribute perfectly throughout the litter, making it extremely economical to use AromaProtect formula: to lock away any unpleasant odour and release a pleasant fragrance in its place Non-tracking: grains will not stick to your cat's paws and be spread throughout your house Easy to use and hygienic: improved odour binding, firmer clumps and long-lasting Cost effective: can be used for up to 32 days Pleasant cotton bloΒom scent: for a permanent fresh feel with this delightful fragrance and a touch of jasmine Made in Germany.